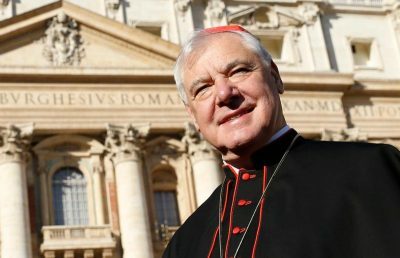 UPDATED – VATICAN CITY (CNS) — To keep silent about the truths of the Catholic faith or to teach the contrary is a form of religious deception that comes from the anti-Christ, said Cardinal Gerhard Muller. The German theologian, who was head of the Congregation for the Doctrine of the Faith from 2012 to 2017, wrote what he called a “Manifesto of Faith.” Subtitled with a verse from John 14:1, “Do not let your hearts be troubled,” the five-page manifesto was released to several Catholic news sites Feb. 8. “In the face of growing confusion about the doctrine of the faith, many bishops, priests, religious and laypeople of the Catholic Church have requested that I make a public testimony about the truth of revelation,” he wrote. “In other places, there are sweeping statements that cannot stand in present form … for example, when it is said that, ‘the conscience of the faithful is not sufficiently formed.’ This generalized sentence is damaging for many believers. And what will many say, when they think of priests who are accused of abuse? Are these priests’ consciences adequately formed? What, above all, are abuse victims supposed to feel when a sentence such as ‘The priest leads the work of salvation on earth,’ is written in such a completely unspecific manner? The right distinction is what makes a theologian,” Cardinal Kasper said. Cardinal Kasper compared Cardinal Muller’s manifesto to the writings of Martin Luther. “I was totally appalled when, toward the end of the manifesto, I read of the ‘fraud of the anti-Christ.’ This is almost literally reminiscent of Martin Luther’s argumentation. Luther also criticized much in the church,” Cardinal Kasper said. “Is there a Luther redivivus behind this manifesto? One that advocates reform in the church, but intends to bypass the pope and oppose him? I do not want to believe that. Because that would only lead to confusion and fragmentation. That would rip the Catholic Church from its hinges. Quoting extensively from the catechism, Cardinal Muller summarized five keys tenants of Catholic doctrine: belief in the Trinity; the nature and authority of the church; Christ’s presence in the sacraments; the “liberating truth” of moral law; and the reality of hell and promise of eternal life. “Many wonder today what purpose the church still has in its existence, when even bishops prefer to be politicians rather than to proclaim the Gospel as teachers of the faith,” he wrote. “The role of the church must not be watered down by trivialities, but its proper place must be addressed,” he wrote in his summary of the immortal nature of the soul and the judgment each person will face immediately after death. “The eternity of the punishment of hell is a terrible reality,” he wrote, and it is the place where the souls of those who die in a state of mortal sin descend. Cardinal Muller said that means that divorced and civilly remarried persons, whose sacramental marriage is considered valid before God, Christians who are not in full communion with the Catholic faith, and those who are not “properly disposed” must not receive Communion. This was another area with which Cardinal Kasper took issue, saying he could not find Cardinal Muller’s arguments in the catechism. Cardinal Muller said that when it comes to priestly ordination, it is not possible to ordain women. “To imply that this impossibility is somehow a form of discrimination against women shows only the lack of understanding for this sacrament, which is not about earthly power but the representation of Christ, the bridegroom of the church,” he wrote. “To keep silent about these and the other truths of the faith” and to teach people what is contrary to the faith “is the greatest deception against which the catechism vigorously warns,” he wrote. It leads people to “a religious delusion” and is “the fraud of anti-Christ,” who seeks to deceive those who are lost and those who have not accepted the love of the truth by which they would be saved. In a final appeal, the cardinal quotes St. Paul’s Second Letter to Timothy (4:1-5): “Proclaim the word; be persistent whether it is convenient or inconvenient; convince, reprimand, encourage through all patience and teaching. “For the time will come when people will not tolerate sound doctrine but, following their own desires and insatiable curiosity, will accumulate teachers and will stop listening to the truth and will be diverted to myths,” the passage continued. Contributing to this story was Zita Ballinger Fletcher.